So You Want A Husky Puppy For Christmas? 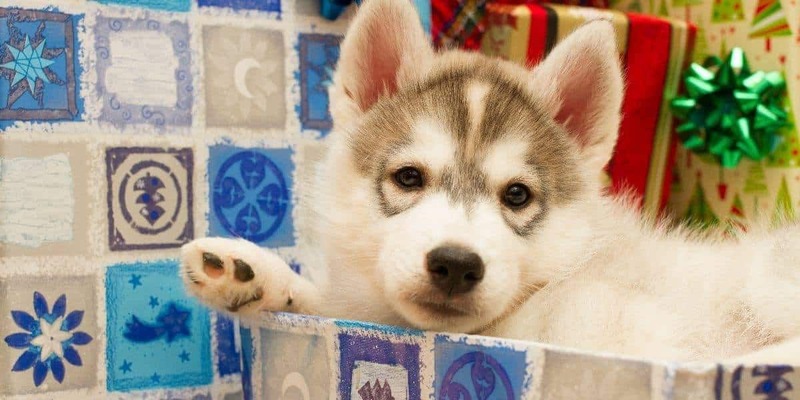 / So You Want A Husky Puppy For Christmas? Are you are looking for a totally unique gift that will surprise your family, bring everyone together, and make this the best Christmas ever? A Siberian Husky puppy will sure do that! But before you rush out to the pet store let’s look over all the things you need to know, how to approach the purchase, and how you might do things a better way to make life easier for you, your family, and of course your future four legged friend. Before we dwell on the negatives, let’s consider the positives of bringing an animal in to your life around the holiday season. First, a pet can greatly enrich you and your family’s life. Whether you are living alone, with a partner, perhaps have kids as well, a dog can give you all unconditional love for many years ahead. If you have had a particularly difficult year the introduction of a new family member might be the change you need to focus on the positives of life and enjoy the simple pleasures of companionship. The exercise requirements of a dog (and especially Huskies) might be the kick-start you need to implement a better health regime. A pet for Christmas can reward your children for maturing and showing compassion, empathy, and responsibility throughout the year. There are many articles on the internet, particularly from animal welfare organisations, that will tell you that giving a pet for Christmas, or as a gift at any time of the year, is a bad idea. They are right: over 20% of abandoned or relinquished animals in to shelters were given as gifts. Dogs need a lot of attention: feeding, training, exercise, and play. They are not a toy that can be put back in the cupboard for later. Every day they need to be tended to and this continues for many years to come. In the weeks and months after Christmas many dogs are given up because the impulse purchase and excitement in December has worn off in January. Siberian Huskies are particularly challenging, especially for those new to the breed. They need more exercise than most other dogs. Their temperament means they can get bored easily. Like most dogs they grow large, fast, and that puppy will quickly become an adult sized dog. We suggest you check out our articles on the Siberian Husky breed, grooming, training, and health issues to make sure you know what you are getting in to. Even simple family activities such as a vacation or weekend away will require you to either transport your animal, or look for carers while you are away. Introducing a puppy to the family during holiday season is particularly challenging. You might not be at home at regular times, and at others you might have many visitors around interrupting family routines. You could be stressed and tired as well. Puppies need a stable environment and constant attention. They might need a dozen small feeds each day, and another dozen toilet training drills. Do you have that much free time and patience at this time of year? Finally let’s debunk the myth that introducing a pet to your children will help them become more responsible. The fact is that a pet should be a reward for showing responsibility during the year. Rarely does the introduction of an animal change the behavior of a child to become more responsible. If your kids are not able to clean up their toys, or their mess at the dinner table, will they suddenly start cleaning up after your dog? Probably not. 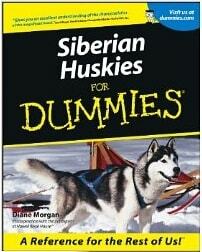 We aren’t suggesting here that a Siberian Husky is a bad idea. What we are asking is that you carefully consider the timing of a puppy purchase and maybe consider an alternative approach. Want to make the introduction of a puppy easier on you and your family? Here are our tips for making life easier, and who wouldn’t want that at Christmas time? Do you really need that overhead just before Christmas? Furthermore if you really want a Siberian Husky puppy there might not be any available, at least from responsible breeders. Mommy Huskies are not machines that pop out babies on demand! Responsible breeders will only breed every second year, or much less. Responsible breeders also breed when the mother and father are ready, and not to meet seasonal demand. Conversely, bad breeders, also known as backyard breeders or puppy farms, will purposefully time the birth of puppies to coincide with the lead up to Christmas. They capitalise on the emotion of the season, breeding to maximize monetary returns and not the love of the animal. If you start seeing puppies in pet shops, or ads in the paper for popular breeds such as Siberian Huskies, there is a good chance there is an unscrupulous breeder behind the scheme. Do you really want to encourage this kind of behaviour? Instead you should consider acquiring a Siberian Husky at another time of the year. At least a few weeks after Christmas when the joy of gift unwrapping has worn off, family routines are back to normal, and you can discuss how you will introduce a puppy in to your family. Start talking to breeders. Use our Breeder Directory to help find one in your area. Talk to them, visit them, find out when they will next breed and release puppies. We have some specific guidance in our Approaching a Breeder article. If you are not going to unwrap a puppy on Christmas day, provide a teaser or proxy in its place. A Kong Toy, a Huskies for Dummies Book, a can of dog food with a bow around it, a leash for puppies, or a dog crate all make for intrigue and interest on Christmas morning! If the excitement in the family lasts in to the new year that’s a good sign that the puppy wasn’t just a passing fancy. Millions of pets are abandoned each year in the USA alone. Try contacting your local animal shelter in the weeks after Christmas and let them know what you are looking for. The popularity of Siberian Huskies (and the demands they place on unsuspecting owners) means they turn up in pounds especially after the holiday season. Local Husky rescue organisations are always looking for new homes. Our rescue organization directory is growing to help you find a Husky in need near you! Yeah we know – a Siberian Husky puppy is just sooooo cute! But will you consider an adult dog instead? First, they are likely to be trained to some extent and socialised. Potty training a Husky puppy can take weeks and require attention many times a day. Are you up for the challenge? Plus an older dog might be more moderate in behavior, better socialized, and less anxious. This can make training easier especially if you have not got experience in training Huskies. You might also not be sure about making such a long commitment to raising a puppy and owning it for many years. Perhaps you want to try out a Husky for a shorter period of time to see how you go? An adult dog is a great way to introduce yourself to the breed. So you still want a dog for Christmas day. How do you make it happen? Start looking NOW! As in from October onwards. Use our breeder directory to find someone local to you who you can talk to and visit. 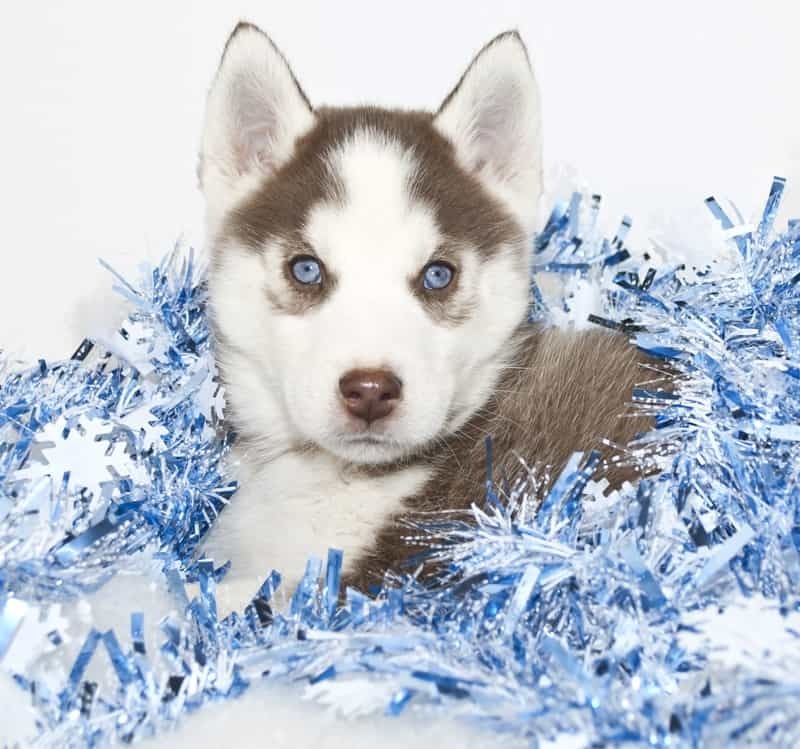 At this time a breeder will know if a female Husky is going to give birth leading up to Christmas and you can start expressing an interest in puppies. If you leave it late you might be forced to by from a pet shop or puppy farm, which we strongly recommend you avoid! If you find yourself in mid-December and have not got a puppy organised you have left it too late, unless…. Pounds, animal shelters, and specialist Husky Rescue organizations are always looking for loving homes. Christmas is a great time to help out animals that would otherwise be left alone while the rest of us are home with family. Local rescue shelters might also let you to take a dog home on a temporary basis to see how things work out. Many shelters actually require this before adoption. Whilst the idea of handing back a ‘Christmas Present’ dog might seem an awful tease, it’s in the animal’s best interest. Plus it is a good test to see if your family can rally together to look after a potential new family member. If things work out well you can ask to adopt the animal outright. Even if the intention all along was to simply foster a dog for a few weeks over the holidays, and hand back later, this gives your family a taste of what to come. You will also learn about the Husky breed and be in a better position to consider what you are looking for in a puppy. You can see how well your regular routines change, especially with respect to exercise. Are you going to surprise the family with a dog on Christmas day? It’s going to be hard to keep a puppy under wraps for the days and weeks leading up to Christmas. Do you have someone else who can help you out? This can be a double edged sword: you might surprise the family, but that bonding between puppy and owner is going to be weaker if somebody else does it for you. Huskies are looking for a pack leader: how are you going to provide that model if you aren’t there to train and command him or her? And don’t even think about hiding the puppy in the garage or back shed! Even small puppies need attention and exercise. Confining a puppy to a closed indoor environment is not a healthy way to start the puppy’s new life with your family. Suspicions also will arouse when your puppy is out back howling out of loneliness! Be sure to have appropriate food for the holidays. Human food from the table is definitely out, as are many other foodstuffs that are toxic to Siberian Huskies. With the rush of the holidays you want to be organised in advance. Your breeder will recommend a menu to follow. Make sure you have enough food to get you through the days when shops (or online deliveries) are closed around Christmas and New Year. Your Husky puppy will need a bed of course, in a not-so-cold environment. A crate for training is a good investment. Some toys for mental stimulation will be needed, plus you can wrap more up under the Christmas tree. You will need a leash so you can take your Husky outdoors and walk him/her. These initial investments need not be expensive and you might find bargains at your local thrift or opportunity store. Puppies need training from birth to help them socialize and behave better. We recommend starting with Cesar’s Way online dog training course which is very comprehensive, affordable, and gets results. Registration or licensing with your local council, a vet check-up and immunizations are all essential for young Husky puppies and should not be forgotten about. 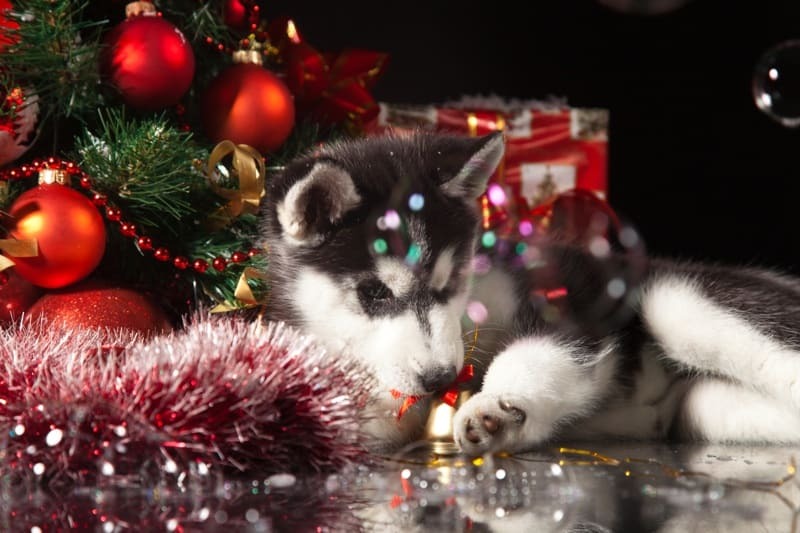 If you are new to Huskies we recommend delaying the purchase or adoption of a puppy until after the Christmas season. However don’t let that stop you buying a present or two to put under the tree as a sign that you are committed to the idea. 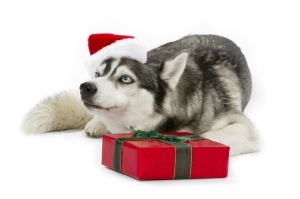 If you really must have a Husky around Christmas you need to get organised early. Puppies are allocated from breeders around their birth so you don’t want to miss out. Try and avoid pet stores or opportunistic breeders who might be looking for a quick buck, and not operating in the animal’s best interest. Also consider fostering an animal in December to see how your family goes with it. Think of it as a trial run and should it work out, you can consider adopting the foster pet, or at least know more about the breed before you commit to raising a puppy. Like all dogs, looking after a Siberian Husky is a rich and wonderful experience. Long after the toys are unwrapped, played with, and forgotten about, a dog will continue to be a part of your life. Take your time in working out what you want, and how to make it happen. It will make a big difference in the months and years ahead.